‘A’ Force Burma, Java Party No. 5A, Robertson Force and later attached to Williams Force. 131km, 133km, Kanchanaburi (evacuated to Nacompaton 19.8.1944), Prachuab Kirikhan-Mergui Escape Road (evacuated to Nacompaton June 1945), Bangkok. Bangkok-Singapore by aircraft, Singapore-Sydney, HMT Highland Chieftan, Singapore-Melbourne-Perth by troop train. Gang of ‘7’ Signals in Adelaide. rear L-R Ron Evans, Kack Kyros, Claude Gault, Merve Wilkinson. Fr Vern Hoppe, Bill Grundy & Ted Cosson. Wilkinson and Cosson had been close mates from childhood. Merve kneeling Front Row, 1st Left. Merve was one of a large number of men from 2/4th who had jumped ship at Fremantle Gauge Roads when ‘Aquitania’ arrived from Sydney on 15th January. When the ship departed the next day 16th January 1942 for Singapore, about 90 men had not re-boarded for many reasons, including not being able to find transport, some had been ‘locked up’ and were unable to free themselves, etc. Whilst a POW in Java Merve was selelcted to work on Burma-Thai Railway with Robertson Force Java Party No. 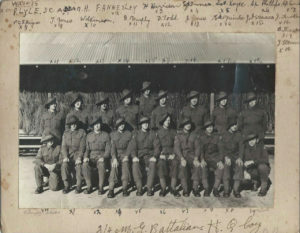 5A with 3 other 2/4th men – Ted Cosson, Cyril Vidler and Les Lee who joined them at Singapore having arrived sick during transit from Java with Java Party No. 4. Merve Wilkinson died 7th April 1970 Perth, WA aged 60 years. He had married Marjorie Ada Brook in 1941. They had 4 children, sadly 2 died in their early lives, however two sons survived. Please read about POWs sending news cards from Burma.